Fostering collaboration will be a key component of your job. The need for improved and enhanced collaboration within and between agencies in the federal government, with state and local governments, as well as with nonprofits and businesses, is now clearly needed. The federal government’s ineffective collaboration with other government organizations was clearly apparent and widely criticized during Hurricane Katrina in 2005.
go beyond the traditional approaches of cooperation and coordination between hierarchical agencies, how are they held accountable in the context of the traditional “rule of law” paradigm? Collaboration occurs when people from different organizations produce something together through joint effort, resources, and decision making, and share ownership of the final product or service. The focus is often on producing or implementing something. Collaboration, however, can mean using one or a mix of tools on a continuum that ranges from the traditional approaches of coordination and cooperation to the creation of new networks, some of which may contain formal partnership agreements. shared vision and trust, independent members, voluntary links, multiple leaders, and clearly defined roles. Conducting a hard-headed assessment up front as to the probability of a network approach working effectively and succeeding will save many headaches later. Even given the difficulty of creating networks, networks possess attributes that cannot be easily created by other vehicles. Networks provide a boundary-spanning mechanism, increase the capacity of participating organizations to combine capabilities, and spur innovation and adaptation to local conditions. Using partnerships. Much like networks, there are different types of partnerships. While partnerships tend to be more defined than networks, they may as a result face more difficulties in getting established. Partnerships do have some distinct advantages. First, a partnership tends to be more resilient when there is a transition in leadership among its members. Since networks are based largely on interpersonal relationships rooted in trust among members, networks are more vulnerable to falling apart when there is substantial turnover of membership or sponsorship. Second, because partnerships involve a more formal set of relationships, it is easier for them to leverage the resources of others. Key determining factors in your decision as to whether to join or create a partnership is whether you conclude that your interests are in alignment with your potential partners’ and whether the benefits of the partnership outweigh the potential costs to you and your organization. As the government moves forward in the decades ahead to meet challenges in many diverse arenas, collaborative networks and partnerships are approaches that can provide you with greater leverage to achieve national goals than the traditional “stovepipe” approach to individual federal programs. We recommend their increased use. Office (GAO) noted in a 2003 report that “national goals are achieved through the use of a variety of tools and, increasingly, through the participation of many organizations that are beyond the direct control of the federal government.” In other words, government is now turning increasingly to networks and partnerships to achieve many national objectives. In a 2012 report for the IBM Center, Drs. Rosemary O’Leary and Catherine Gerard describe why agencies collaborate, the barriers to collaboration, and the skill set that senior federal executives need to be a successful leader in a collaborative environment. Identifying these leaders in your organization and ensuring they receive the development experiences needed to work across boundaries – and recognition for doing so – will be an important part of your job. The value of collaboration as a new approach or tool for government managers is receiving increasing appreciation and notice throughout the federal government. GAO notes, “Promoting effective partnerships with third parties in the formulation and design of complex national initiatives will prove increasingly vital to achieving key outcomes.…” In a 2012 report, GAO identifies a dozen different ways to collaborate and identifies critical success factors, as well. The Office of Personnel Management’s list of the core competencies for the federal senior executive of the future now includes not only the ability to work in a team environment, but also the ability to develop alliances with external groups (e.g., other agencies or firms, state and local governments, Congress, and clientele groups), and to be able to engage in cross-functional activities, as well as find common ground with a widening range of stakeholders. This report offers practical design advice to public managers and political leaders who are facing complex, dynamic public challenges involving multiple stakeholders on issues or problems where there is no clearly defined solution. In these situations, open project approaches have the potential to spark large-scale activity that could fundamentally change society. Based on his observations about the creation and evolution of the Internet, Witzel identifies a dozen tips for designing open projects. Witzel believes, on reflection, that these 12 practices were critical to the Internet’s successful development and can be applied in other domains, such as the creation of the nationwide health information network. This report provides valuable insights into how federal senior executives view collaboration, based on survey responses from over 300 members of the federal Senior Executive Service. Survey respondents clearly recognize that the job of senior executives today involves collaboration within their agency, their department, and the federal government, as well as with key external partners and stakeholders. The report concludes with eight insightful tips about how to collaborate in government, including the view of senior executives that the foundation of success in collaboration is common purpose, while another is “don’t be afraid of conflict—expect it.” The report also includes valuable insights into why agencies collaborate, the barriers to collaboration, and the skill set needed to be a collaborative manager. This report offers practical advice to public managers and political leaders who are addressing complex public challenges through multi-organizational networks. The use of collaborative networks of organizations has matured in the past decade. However, the developers of collaborative networks face political, organizational, and technological challenges in a world accustomed to the traditional, hierarchical approach to problem solving and accountability. Professors Fedorowicz and Sawyer draw on a six-year project, which collected data on 266 collaborative networks of public safety organizations, such as law enforcement and first responders to emergencies. This report identifies the necessary conditions, capacities, organizational models, and experiences that drive successful collaborative ventures resulting in cleaner water, air, and land. The authors discuss what it takes to start such a collaborative initiative and — more importantly — how to sustain an initiative over time. This report joins two recent IBM Center reports that have also examined the relationship between government agencies and private and nonprofit organizations. In their report, Food Safety—Emerging Public-Private Approaches: A Perspective for Local, State, and Government Leaders, Professors Noel P. Greis and Monica L. Nogueira recommend the creation of new co-regulation strategies to shape food safety policies that reflect mutual organizational and financial interests of both public and private sectors. Co-regulation activities might include setting risk-based inspection standards and jointly establishing best practices, enforcement, and monitoring approaches. This report describes the current responsibilities of key federal agencies now responsible for food safety in America, including the Food and Drug Administration, the Food Safety and Inspection Service, and the Centers for Disease Control. The report also describes legislation now pending before Congress, which would modify the current responsibilities for agencies now involved in food safety. Over the last decade, the importance of an effective “supply chain” has become widely accepted in the both the public and private sectors. The federal government today clearly recognizes that an effective supply chain can lead to cost savings, and in certain instances, save lives. With the creation of the U.S. Department of Defense (DoD) Logistics Agency, the U.S. military recognized the critical importance of supply chain management to facilitate its multi-missions and support its personnel. In addition to serving as an excellent introduction to supply chain management, Professor Handfield’s report increases our understanding of how to assess supply chain preparedness. Dr. Moseley shows how stewardship contracting works, via a series of case studies examining the experiences of the Bureau of Land Management and the U.S. Forest Service. She found that leaders in these agencies were able to change the behaviors of their hierarchically-driven culture by using four strategies to foster collaboration: (1) creating time and space for collaboration, (2) changing agency rules to encourage collaboration, (3) providing staff incentives to collaborate, and (4) building the capacity to collaborate in both the agency as well as among stakeholders. This report focuses specifically on a cross-sector collaborative effort to significantly reduce traffic congestion in the Twin Cities metropolitan area of Minnesota. The organizers of the program concluded that a collaborative, multi-modal approach was crucial to making real headway on a longstanding, costly, nearly intractable public problem. Cross-sector collaboration is now increasingly both necessary and desirable as a strategy for addressing many of society's most complex public challenges. Read about our efforts to update the Operator's Manual. 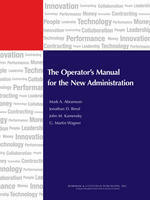 Read our other Operator's Manual Blog, an update of Chapter One: Leadership. Read our update of Chapter Two: Performance. Read our update of Chapter Three: People. Read our update of Chapter Four: Money. Read our update of Chapter Five: Contracting. Read our update of Chapter Six: Technology. Read our update of Chapter Seven: Innovation. Read the original chapters of the Operator's Manual. Read materials related to Governing in the Next Four Years.